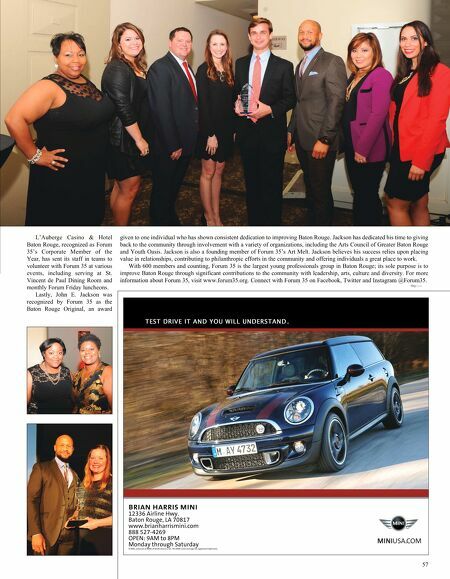 57 L'Auberge Casino & Hotel Baton Rouge, recognized as Forum 35's Corporate Member of the Year, has sent its staff in teams to volunteer with Forum 35 at various events, including serving at St. Vincent de Paul Dining Room and monthly Forum Friday luncheons. Lastly, John E. Jackson was recognized by Forum 35 as the Baton Rouge Original, an award given to one individual who has shown consistent dedication to improving Baton Rouge. Jackson has dedicated his time to giving back to the community through involvement with a variety of organizations, including the Arts Council of Greater Baton Rouge and Youth Oasis. Jackson is also a founding member of Forum 35's Art Melt. Jackson believes his success relies upon placing value in relationships, contributing to philanthropic efforts in the community and offering individuals a great place to work. 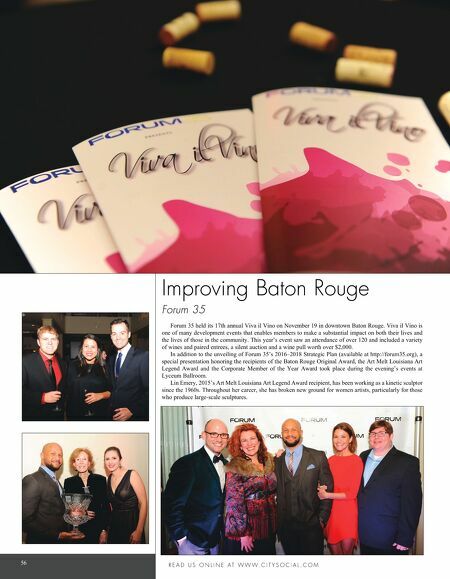 With 600 members and counting, Forum 35 is the largest young professionals group in Baton Rouge; its sole purpose is to improve Baton Rouge through significant contributions to the community with leadership, arts, culture and diversity. For more information about Forum 35, visit www.forum35.org. Connect with Forum 35 on Facebook, Twitter and Instagram @Forum35.